This unique commemorative box-set brings together four spectacular Opera Australia productions of bel canto, grand opera and verismo favourites, plus the concert with Luciano Pavarotti, all featuring the incomparable Dame Joan Sutherland. 'La Stupenda', as she was affectionately and admiringly known, defined the interpretation of these formidable and vulnerable heroines in the second half of the 20th century. 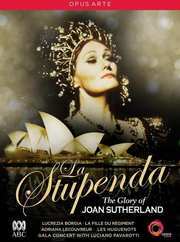 Recorded between 1983 and her gala retirement in 1990, all these unforgettable nights at the Sydney Opera House are graced with Sutherland's upper register of undimmed magnificence, and 'glittering, unmistakable brilliance of sound' (The Canberra Times).